I have been on a digital design kick lately. I had gotten so busy that I hadn’t done much lately and I’d forgotten how much I enjoy it. So, I’ve been catching up. The good news is that it will be super simple to add some great extras to your Thanksgiving decor and this print would look lovely as part of your Thanksgiving Day dinner. Or really for any time of the year. Because there is always something to be thankful for. I will be putting this in our living room when I get around to decorating that… Some day. 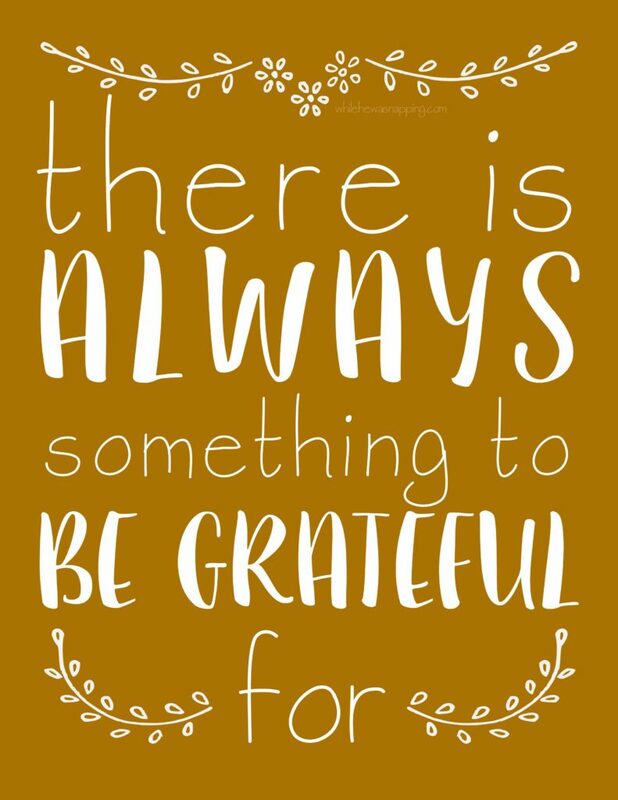 When my kids are running rampant and my house looks like a natural disaster zone, some times I need a gratitude reminder. This gratitude printable will hopefully help me remember what I have, not focus on what I’m lacking. It might be a while before it gets up permanently – I’ve got a whole slew of other projects on my to-do list right now. I might have to give it a temporary home for now. Okay, want your own copy of this gratitude printable? It will open a new window where you can download the high resolution, watermark-free version of the image and save it to your computer. After that, you can print it on your home computer. Feel free to make as many copies as you like, but please direct friends and family back to this webpage to get their own copies. It helps me analyze what kind of printables are the most popular so I can make sure to create more of them! This image is for personal use only. No variations, edits or changes may be made. Thanks, you are amazing! The laurel embellishments on the image are courtesy Oh So Nifty Vintage Graphics.